Our team at Peterborough Smiles Dental Centre. Dr. John Lau, HBSc., MSc., D.D.S. Dr. John Lau received his Bachelor of Science (Honours) in Pharmacology and Toxicology, Masters of Science in Pathology and his Doctor of Dental Surgery from the University of Western Ontario. He has been practicing in Peterborough since 2002, and establised his own practice, Peterborough Smiles Dental Centre in 2009. Dr. Lau is proud to call Peterborough home and enjoys fishing, snowmobiling, and spending time with his wife and three daughters. Laurel graduated with honours in 2009 from the Dental Hygiene program at Georgian College. She has worked at Peterborough Smiles Dental Centre since 2011 and feels proud to be part of such a caring team, where the clients are treated like family. Laurel brings with her a warm and gentle professional approach to preventative oral care. In her spare time, she enjoys spending time with friends, family, and staying active. Natasha has always had an interest in persuing a career in dentistry since she was a child. She graduated from Dental Assisting in 2011 from Durham College. Although she loved the program, she decided that she wanted to persue a career in Dental Hygiene, which she graduated in 2013 from Durham College. Natasha was born and raised in Peterborough. She takes pride in making sure all her patients understand the importance of their oral health as it relates to overall health. Jamie was born and raised in Peterborough. She graduated from Dental Hygiene at Cambrian College in 2005. Jamie has been working in Peterborough as a Dental Hygienist for nine years and with Peterborough Smiles Dental Centre since it's opening in 2009. Jamie was married in 2012, and likes to travel with her husband. Jessica was born and raised in Peterborough. She graduated in 2015 from Durham College, where she gained her passion for preventative oral care. Amanda was born and raised in Peterborough. Before deciding to get into the dental field, Amanda explored studies of Child and Youth, and Business. Amanda later graduated with Honours from Dental Office Administration at George Brown College in 2014. After gaining experience working downtown Toronto, she moved back home to be closer to friends and family. She is excited to be back, and part of the team! Danielle has lived in Peterborough and surrounding area most of her life. She has worked in the Dental Field doing office administraion since 2012. She enjoys spending her time with family and friends, and being outdoors. Danielle is excited to be a part of the Peterborough Smiles Dental Centre team! Heather has lived in Peterborough since 1996. She is a certified Level 2 Dental Assistant with over 20 years experience. Heather has been with Peterborough Smiles Dental Centre since 2009. 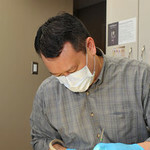 Linda has worked with Dr. Lau since he started his dental career in 2002. She has enjoyed watching the practice grow and particularly the interaction with the patients. Her goal is to make the patients feel relaxed and welcome, and leave the office having had a positive experience and maybe a few laughs along the way.